Blockchain Development: How is it redefining FinTech industry? 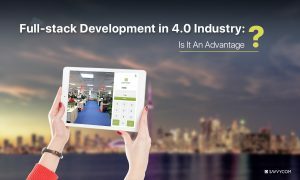 In the Industry 4.0 era, people are getting obsessed with “Blockchain”, the technology that has been bringing about a dramatic transformation in all industrial sectors. FinTech is no exception. Owing to a number of considerable changes in this industry, there is a common belief that managing the Blockchain technology is the key leverage for almost every business development in finance, from retail banking to insurance to investment banking. So, how exactly is Blockchain transforming FinTech industry? Let’s discuss it together. How is Blockchain technology and applications revolutionising FinTech? We all know that money is a medium of exchange. Since the days our ancestors began bartering, the concept of money has been continuously developed. In thousands of years, in ancient civilizations, people used shells, miniature replicas of bronze tools and rare metals like silver and gold to exchange goods. Then, banknotes, coins, credit cards, electronic money were invented one after another. And now we are evolving a new system – cryptocurrencies. Bitcoin, Ethereum, Ripple, Litecoin, etc have made a mark on FinTech. In this article, we will illustrate my points with examples of Bitcoin for its popularity. Cryptocurrency is the most well-known Blockchain application, whose first generation is Bitcoin. It allows people to transfer money securely, worldwide and without a third party. Bitcoin is not only a means of payment like gold, silver, paper money, it will also change and redefine the whole monetary system and a huge threat to the governments and banking system who are controlling people’s every single coin. One of the greatest problems that FinTech is still facing is the security. If you want to transfer money, you need to ask the bank to make the transfer orders for yourself. This is a centralized way of transferring money, which means that all the clues are centred on a management position. However, when Blockchain developers have created sophisticated processes, transactions will get uniquely validated by software, which eliminates the need for third-party verifiers. It is predicted that traditional banks will soon fade away due to FinTech solutions and blockchain development companies. First, we should take a look at how Bitcoin reduces the time of transactions. How Blockchain works. (Source: ValueCoders). Every Bitcoin user has a crypto wallet, which contains his/her coin number and exchanged with each other as bank transfer, without any presence and involvement of any bank – and that makes the difference between Bitcoin and the traditional practices. People can transfer money, trade with each other via bitcoin freely, no fees, and no one to coordinate or control. Each Bitcoin users will be linked together by peer-to-peer. Two computers connect directly to each other via the internet, download the same BTC transaction software and exchange with each other through the internet. Next, let’s see the several big advantages Bitcoin has brought to E-commerce. Nowadays, making online payments through internet banking is extremely secure. However, you may still face the threat of your confidential personal data being hacked by hackers. What is the solution? The answer is the blockchain wallet. Remember, a blockchain wallet, for example, a Bitcoin wallet can only be operated by its own owner. When a transaction proceeds, he/she will have to create a complicated address for the money recipient, such as 1vjEGKmhB52kwsXWKku, which is difficult to perceive. In addition, the recipient’s name will be kept secret. There is no third-party intervention, which reduces the unnecessary cost. As a result, the speed of the transaction will be increased as well. Bitcoin allows us to make instant and clear payments, leading to speedy out-shipping product process. The buyer will be no longer waiting for hours or even days to do online shopping. The demand for blockchain-based payment is growing these days; therefore, there are more and more Blockchain development companies, especially the ones who develop blockchain wallet. At Savvycom, we believe that Bitcoin is far from the only application of Blockchain as it is changing the way businesses transact across almost every industry, especially the financial world, in the global economy. On a recent project with our client, we built a Crypto Wallet based on an Ethereum network. Ethereum is the second largest cryptocurrency in the world. The wallet interacts with Bitcoin and Ethereum Blockchain, managing the wallet security policy and sending the funds over the blockchain network. Savvycom built an Ethereum-based Crypto Wallet. (Source: CryptosRUs). The mobile app is to allow users to use it as a quick and easy payment method in daily activities. App users can use the app to pay for their fast food, their groceries, even for cars within a few taps. Users can easily send messages to each other through private message, channel or group. Messages could be text, photo, video, voice, contact, location or even the currency itself, like sending money through chat. As mentioned above, Bitcoin is the first generation of Blockchain. How about the second and the third? How can they help in solving the middle-man problem in financial services? We all know what Blockchain is capable of – it facilitates the transactions between the two parties without the need for a middle-man. Blockchain can build a bridge of trust between businesses and consumers. How about an “automatic” and “smart” contract, which also requires no other parties in the implementation of the contract? That is the idea of the Smart Contract and the Ethereum Blockchain. Ethereum is also a distributed public blockchain network and it is worth noticing that there is a substantial difference in purpose and capability between Ethereum and Bitcoin. Bitcoin blockchain is used to track ownership of digital currency while the Ethereum blockchain focuses on running the programming code of any decentralized application. A Smart Contract running on the blockchain can self-execute whenever specific conditions are met. As it runs on the blockchain, Smart Contract run exactly as programmed without any possibility of censorship, downtime, fraud or third-party interference. Savvycom – one of the most trusted apps and software developers in Vietnam and Global, is highly interested in the world of Blockchain and FinTech. We believe that Blockchain and FinTech are reshaping and redefining the way we make businesses in a very near future. With the vision to brighten the future of both businesses – by offering the highest-value opportunities in technology and consumers – in this FinTech case – by protecting their rights with the data and transaction integrity. Together with Savvycom, firms can fully utilize the Blockchain in pushing their businesses forward in this 4.0 era, as managing this technology can separate the winners and losers as the financial services industry, which is moving from exploration to application. For further information, please contact us to get free quote and consultancy.